The 2AR-FE was released in 2008. It came to replace the 2.4-liter 2AZ engine. The engine consumes less fuel than the predecessor, but the output is on the same level. Engineers achieved such result by applying modern technologies in the engine development. Together with the 2.5-liter engine, the manufacturer also produces the 2.7-liter engine 1AR-FE. Like the predecessor, the 2AR engine has aluminum cylinder block with thin cast iron liners inside. The block cannot be repaired for this engine. Liners are not replaceable. Inside the block, there is forged steel crankshaft moved by 10 mm to the exhaust side (an offset crankshaft). The crankshaft has eight counterweights and is fully balanced. The crankshaft drives two balancer shafts through a gear inside the crankcase kill vibrations. The significant changes are in the cylinder head. 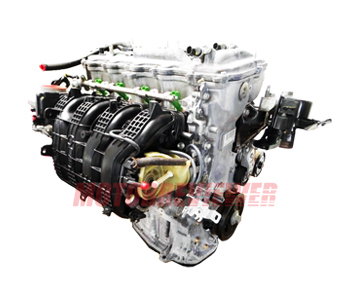 The head is DOHC 16-valve and made of aluminum alloy. It has hydraulic lifters (the 2AZ has not). There are two camshafts, and each of them is equipped with a variable valve timing system called Dual-VVTi. There are roller rockers for the valvetrain. The engine was developed by applying low friction technologies. The pistons use reduced-tension piston rings. The oil pump is variable and has three-stage of operation. The ACIS or Acoustic Control Induction System is a variable geometry intake system. The plastic intake manifold changes the length of the intake tract in two stages by valves in depends on engine rpm and throttle angle. The fuel system got new 12-hole long-nozzle fuel injectors maximized fuel economy and reduced harmful emissions. The intake includes a stainless steel header and catalytic converter. Toyota developed the replacement for the 2AR-FE engine in 2016 - the new 2.5l engine of the "Dynamic Force Engines" series called as the A25A-FKS. The engine turned very good. We didn't find any noticeable problems or defects. The engine is featured by a knocking sound from the VVTi system when it is cold, but this doesn't affect reliability and longevity. Cylinder block longevity limits the engine life, and it is about 150-200k miles. 2AR-FSE. Version with direct fuel injection D4-S and port injection. The cylinder head, cams, pistons and fuel system were redeveloped for this engine. The compression ratio is 13.0:1. 2AR-FXE. The Atkinson cycle version of 2AR. The compression ratio is 12.5 to 1. This engine was designed to install into hybrid Toyota and Lexus models. For example, output in the Camry hybrid is 154 hp and 153 lb ft of torque.